Another LD Jam in the books, which means it’s time for another post mortem! This game pushed us to some new limits. Submitted the game to the jam early due to work (which also meant we didn’t have time for music), but all in all we’re quite proud of it. The theme gave us some pause when we learned what it was, mostly due to the fact that we had so many cool ideas that we wanted to explore. 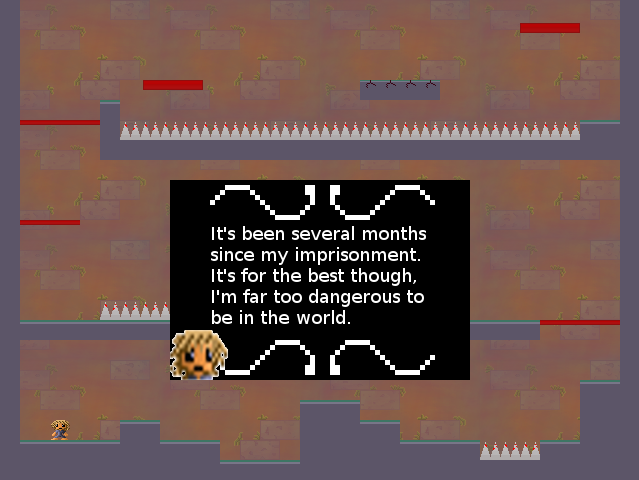 Ultimately we settled for a game about a prisoner with a curse who can choose their fate. The game has 3 endings, the third of which is the hardest to get. Coding in 3 endings was a new challenge for me (Andrew) since I’ve never done anything like that before in a game. The art was done by Bez Imlay and it was her first time doing a jam. She’s been working on and off with pixel art for the past year or so and we’re both happy with her hard work! She also wrote the story and helped with the design of the game. So, this is my second time competing in LD and this is also my second game. I feel like this game is significantly better than the first one I made, but I also had more time and less stress during the event this time. Overall, it seems people have enjoyed themselves when playing it, which is fantastic! I hope it means I did something right. Learning from my last game, I had the goals of making this game play longer than my previous game (you can rush through my previous game in under 1 min) and to have decent sound effects, especially since I’m a bit of an audio guy. Anyway, what went right this time is that I was ready for this event from the get go. I got off of work at 6:30p and the theme was announced at 7:00p my time. I immediately went to a coffee shop with an idea already brewing in my head and started to jot down ideas and even levels. I decided to try both themes this time, but one definitely had a bigger drive in the game than the other. Two-button controls was my main focus and the gameplay definitely shows this. In the game the character (named Zorc) cannot do anything. You have to manually select which mechanics he can do and assign them to the either the Z or the C key. The gameplay is tedious at times because of this, but what I tried to do to help alleviate this annoyance was add beautiful bell tones that play whenever Zorc moves or when you select mechanics from the menu. Add a drone-esque tone with a rhythmic recurring note and I built an audio atmosphere that I’m proud of. All the sound effects were stock sounds from Reason 7, with a little bit of synth editing and mastering the sound in Audacity. Focusing on the audio was what helped pull this together. I originally planned about an hour or two for audio, but I spent about four hours (maybe five) working on it and implementing into the game. This is because part of what didn’t go right was the graphics. You can easily tell that I do not know what I’m doing with graphics. I still want to learn how to, and for the next jam that’ll be a goal I’ll strive for. Another thing that didn’t go right was time management. There are several known bugs in the code and I spent way too much time trying to fix them. It wasn’t a good idea because the game as a whole suffered for it. I had to scrap levels, mechanics, and even art because I tried to fix bugs that would need more time and thought to fix than a 48/72 hour event can provide. Because of this, I was forced to submit my game to the Jam. I submitted my game to the jam last time, which is fine, but last time I had a better reason to. This time I was being stupid. I also tried new things that I have never done with code before (which is the reason for the bugs) and that only made things worse. I also did not account for international keyboards. I’ve had several players from Europe mention that the ‘Z’ and ‘Y’ button are different from American keyboards, which drastically changes how the game is played (Z and C keys plus the mouse). This meant that the mouse was more of a hindrance for these players since they had to use two hands to Zorc instead of one. I will have to be less ignorant for my next game. 1. Focus more on art. It will probably be pixel art. 2. Don’t be too ambitious. Strive for an idea that fits the theme but is also something you have done before or will be easy to do. 3. Manage your time better. 4. Be wary of the controls for other people and who the controls will affect the game for them. For the future, I would actually like to pursue an idea like this. I wouldn’t just have two button controls for an actual game, but I do like the idea of having a game with a very interactive audio atmosphere that the player can directly control and influence. That sounds neat to me. I originally thought I’d have to use Unity to make such a thing, and I’m still very new to programming. But I made THIS game in Game Maker. So I may just be able to pull off my idea in a program I’m already accustomed to, which is unbelievably exciting and reassuring. Thanks for taking the time to read this if you made it this far. And if you haven’t had a chance to play my game, then here’s the link: BAM! I’m choosing things that were the most fun and unique from what I’ve seen so far. Can’t wait to play more! Also, if you want to check out my game, then BAM! So I did the stupid thing and had way too big of a scope, but I have scaled back and have made some good progress. Most of the mechanics are done, all the levels are planned out, and the story is fleshed out as well. Graphics will get some more work later before the jam ends. I’m in! My goal back in August was to participate in 4 game jams throughout the year: LD 33, LD 34, LD 35, and global game jam. LD 33 was fun and I learned a lot, but now it is time for my second jam of the year: LD 34! 1. GameMaker Studio for code and engine stuff. 2. Reason, Audacity, Finale, and BFXR for audio stuff. 3. GIMP for art stuff. 4. Paper for design stuff. Last time I was couch surfing and made the game from coffee shops, the university campus near where I live, and a coffee table at a friend’s house. This time I have my desk setup and everything, but I do have to work during one day of the event. For LD 33, I submitted my game to the Jam, but this time I’m going for the Compo. So, my game Within suffered a lot due to real life experiences I had to deal with during this event. I almost opted out of the event completely, but thanks to a few good friends and, what I’m guessing to be, luck, I actually made my first game and I was able to submit it to Ludum Dare 33. Pretty surreal! My highest score was Mood (which is cool, because I was definitely going for that with my take on the theme) but out of all the other ratings, Audio is technically the highest as I placed pretty well. What’s interesting, too, is that I only spent an hour on my music (including writing and editing it). What’s even more interesting is how this reflects who I am as a person; I studied music and music composition in college. It’s very uplifting to see that education playing a vital role in my game’s success. Unfortunately, I was going through a big move during this event. I was actually couch surfing during the creation of the game, and after I moved in and judging was commencing I was unable to rate and play as effectively as I wanted due to lack of internet. I was able to get a couple of games in here and there with my terrible laptop and a connection provided by a coffee shop, but these were mostly restricted to web games. My game has very simple controls, so the level design is simple as well. However, if you have played it, you realize that the switches or buttons in each level can be cryptic and their effect can be lost on the player because of poor implementation. I’m sure if I had more time, I would have been able to make a better system. I used Game Maker to make this game, and thanks to Shaun Spalding’s tutorials on YouTube I was able to have a quickly working platformer engine for my game that I was also able to tweak. Still, in the future I would like to have more experience writing code from scratch for an event like this. Several commenters pointed out that my game looks and even feels a bit like “Thomas Was Alone” by Mike Bithell. The square based sprites was really all I had time for and, naturally, I see the resemblance, but rest assured that I didn’t even have that beautiful game in mind when I was crafting my own. This area is probably my weakest point with game creation. If I pursue games, this will be the area I will need to work the most on. That, or work with a team. Was trying to finish in time for the Compo, but I missed that deadline so I’ll just submit my game to the Jam. Next time I’ll try and make the Compo! Can’t wait to play some of these games! On just about all accounts, my game is probably gonna suffer. But considering how crazy life has been, I’m just glad to be even trying to make a game in 48/72 hours. Here’s a screenshot of the first level. First time doing Ludum Dare. Tried making games before (GameMaker, Unity, Gimp) but I haven’t finished anything yet. Because of that, my thought process with this Jam is that whatever I do I will make SOMETHING playable by the end of it and upload it.